Although Tenerife boasts a huge number of international restaurants which serve everything from Chinese and Indian cuisine to Greek and British food, there are also many superb Canarian restaurants which offer delicious and authentic Canarian cuisine. 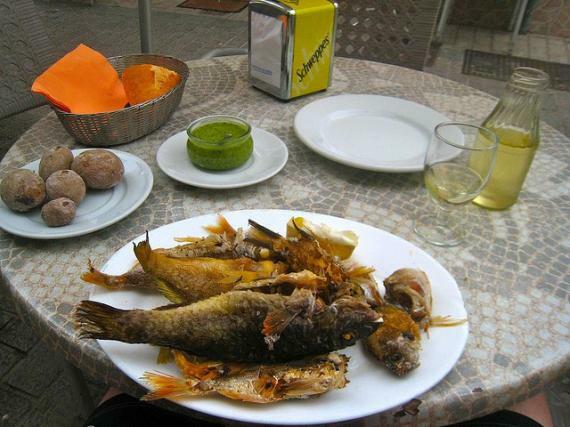 Thanks to Tenerife being an island surrounded by water, fish and seafood take prime position on Canarian menus in restaurants found along the coast. Puerto de La Cruz, El Médano, Los Abrigos, Las Galletas and La Caleta are just a handful of villages and towns where you’ll find superb fish and seafood restaurants. Vieja (parrot fish) is a popular favourite amongst the locals and is usually pan-fried and served whole with some lemon wedges. Cherne (wreckfish) and Dorada (sea bream) also feature on many menus and are often filleted and either pan-fried or grilled. The choice of seafood in Tenerife is just as impressive and varied, with Calamari a la Romana (battered and fried calamari) being one of the most widely available dishes. Camarones (shrimp) are also popular and are served piled high on a plate still in their shells. 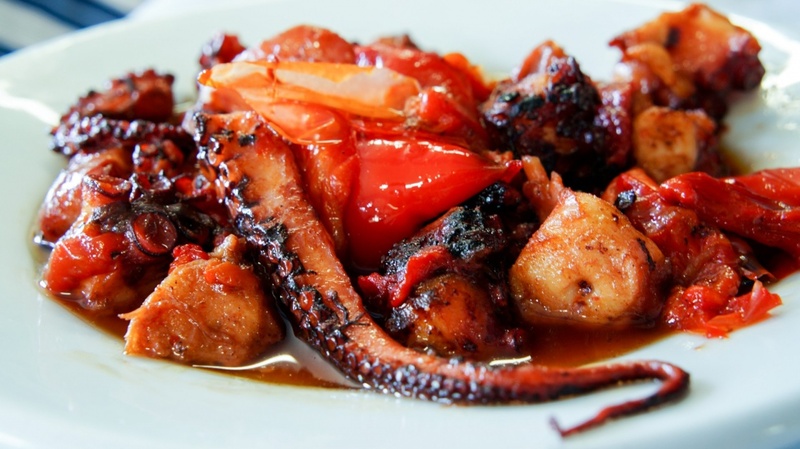 Pulpo (octopus) is only for the brave and is deep-fried and served up whole – tentacles and all. Carnivores will be just as pleased with the top selection of meat available throughout the island. Many restaurants boast the name Brasero (grill) and pride themselves on serving only the very finest grilled and barbecued fresh meat. These types of restaurants are often very relaxed and sometimes don’t even have a menu – the server will simply come to your table and tell you what the chef is preparing that day. Huge chops and cuts of pork, beef, rabbit, goat, chicken and lamb are common. The chef often cooks in the dining area or sometimes in an open kitchen, so not only do you get to savour amazing food, but you also get to enjoy a cooking show. One of the most popular dishes travellers try during their time in Tenerife is Papas Arrugadas con Mojo (Canarian potatoes with mojo sauce). 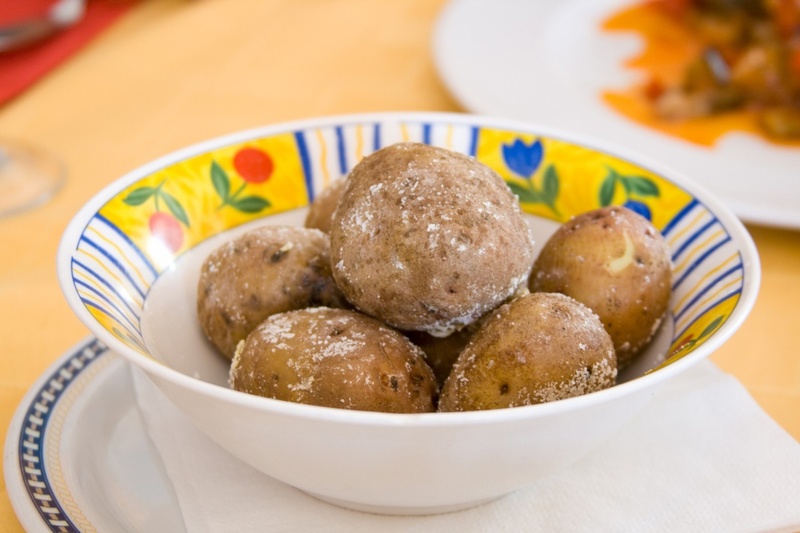 These potatoes are found in almost every Canarian restaurant, with most international eateries including them on their menus, too. They are small bite-sized potatoes boiled in their skins in salty water and left to dry until the outsides are shrivelled and the insides are light and fluffy. Mojo comes in several variations: green, smooth red and spicy red. The green type is made with green peppers and coriander whilst the red is made with red peppers and either a few or a lot of chillies, according to the spiciness of the mojo. Tenerife is renowned for its high-quality wine which is produced on the island at local vineyards. 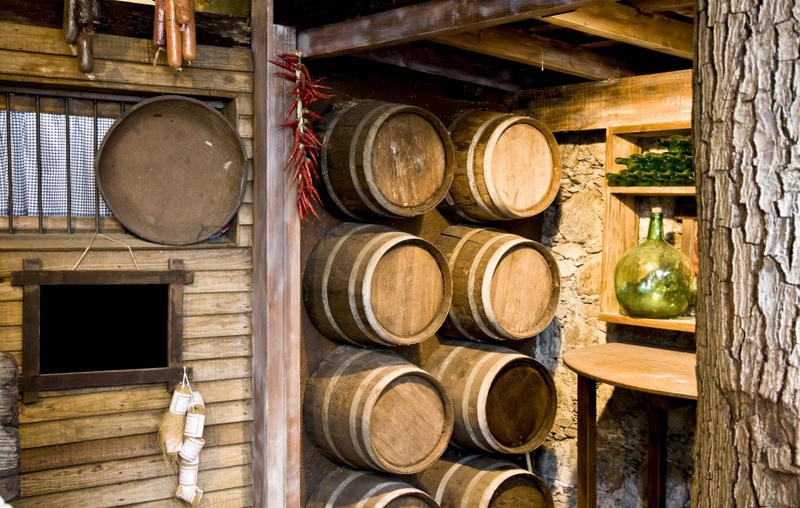 The best place to sample the wines is from the actual vineyards themselves, many of which also serve other locally-produced items, such as honey and cheese. If you can’t get to a vineyard, you’ll be pleased to hear that many Canarian restaurants offer a comprehensive wine list, full of bottles from the area. If you’re unsure which to pick, ask your server if any of the wines have won awards – several have – and then make your choice.